The foodservice industry is growing at a rapid pace across the world due to factors such as innovation and customization in menus, rising demand for gluten-free food, increasing demand for nutritious meals, aggressive marketing campaigns, and the emergence of numerous foodservice outlets. As the foodservice industry is the major end-user of crabs, the growth in the foodservice sector will directly propel the growth of the crab market during the forecast period. 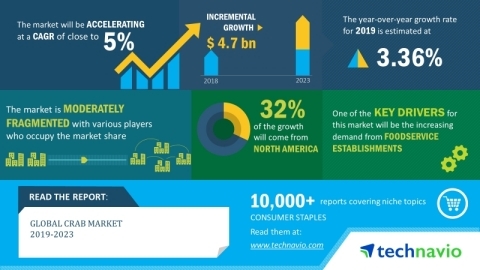 As per Technavio, the growth in online market will have a positive impact on the market and contribute to its growth significantly over the forecast period. This global crab market 2019-2023research report also analyzes other important trends and market drivers that will affect market growth over 2019-2023. The e-commerce market has brought about a revolution in almost every industry vertical, and the crab market is no exception. The sales of fish and seafood products such as crabmeat are increasing significantly through online and e-commerce channels. These platforms support both business-to-business (B2B) and business-to-consumer (B2C) operations. For instance, Ocean Executive is a B2B marketplace that connects seafood companies across the supply chain, from fishermen, processors, and wholesalers to grocery stores and large restaurant chains. At the B2C level, vendors in the market offer products on their websites or through established e-commerce sites like Amazon. With customers increasingly adopting online shopping due to convenience and flexibility, vendors in the crab market have immense opportunities to target Internet-savvy customers and venture into the growing online retail format. "Crab offers a myriad of health benefits, as it contains substantial amounts of minerals, proteins, and vitamins. It is low in saturated fats and is a significant source of docosahexaenoic acid, omega-3 fatty acids, and eicosapentaenoic acid. Crab also has anti-inflammatory properties, which can be beneficial for people with arthritis. Moreover, consumers are becoming more aware of these health benefits of crab, which will propel the demand for crab during the forecast period," says a senior research analyst at Technavio. This market research report segments the global crab market by end-user (foodservice and retail) and geographic regions (North America, APAC, Europe, South America, and MEA). The foodservice segment held the largest crab market share in 2018. Crab dishes are gaining immense popularity in many fast-casual and quick-service restaurants around the world. The growth of this segment is mainly driven by the expansion of fast-casual seafood restaurant chains. The North America region led the market in 2018, followed by APAC, Europe, South America, and MEA respectively. The market growth in North America can be attributed to the increasing number of seafood foodservice chains in the US, and Canada.